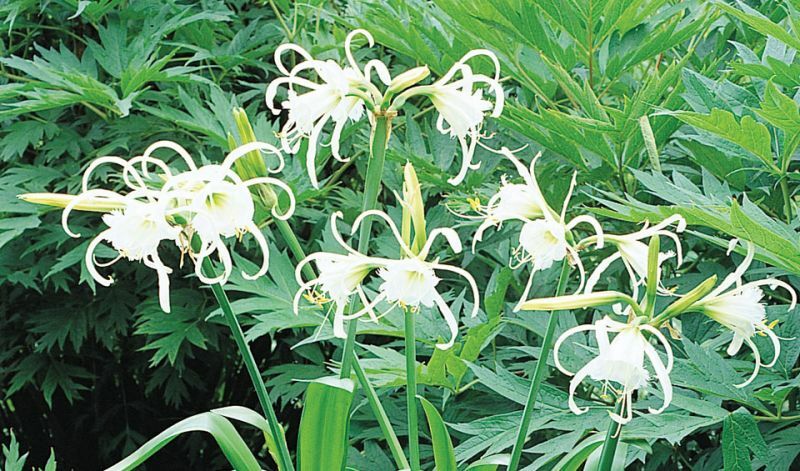 The stems of these bulbs will produce a cluster of 2-5 marvelously fragrant flowers which have a long cup with projecting stamens and will measure about 6-8" / 15-20 cm in diameter. From their strap-shaped foliage you can tell that they are related to the Amaryllis family. Quite often they are grown in pots and treated as house- or greenhouse-plants. (Besides the species itself); 'Advance' (white) and 'Zwanenburg' (white). One hybrid is also fairly popular: 'Sulphur Queen' (cream-yellow). Native to the Caribbean and the tropical- and sub-tropical areas of both North- and South America.